This picture is from Dutch Boy drum major Adam Billings. 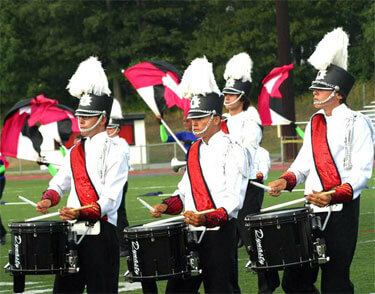 This is our drum line performing at the 2005 Drum Corps International World Championships in Brockton, Mass. It has been eight months since we last performed, and these three snare players are continuing on the road to Madison this summer. From left to right: Sean Filice (joined Dutch Boy in 2005), Cody Cook (joined Dutch Boy in 2003 and is the nephew of the corps director Steve Meikle) and finally Darren Milani (joined Dutch Boy in 2003 and is currently the section leader of the drum line). Way to go guys. You deserve this!